In the Dirt: Rangers Make Changes Is Holik Next? Rangers Make Changes Is Holik Next? 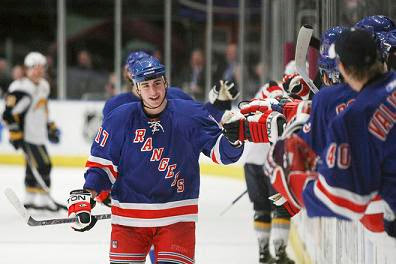 After a five day vacation the Rangers went back to work yesterday and had a triumphant 5-1 victory over the Buffalo Sabres. Brandon Shanahan returned to the lineup and scored a goal after sitting the previous five games to rest his knee, hip, and hamstring. During the game he skated on a line with Scott Gomez and Nigel Dawes. With Gomez skating on Shanahan's line Brandon Dubinsky was moved up to the first line with Jaromir Jagr and Sean Avery. This is a move that paid off big time. Dubinsky has improved his overall game in a big way since he was last on a line with Jagr. Dubinsky lead the charge against the Sabres with a goal and a pair of assists, but the change energized everyone as Avery scored a pair of goals and Jagr chipped in with a couple of assists. Jagr is still stuck on 15 goals and has not scored one in the last 10 games. 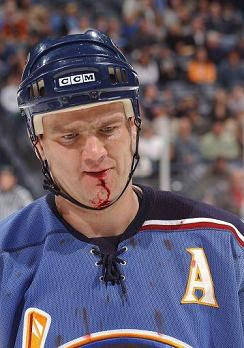 If he does not pick one up soon the Rangers may make a move for his former Ranger line-mate Bobby Holik. While playing 31 games together in 03/04 Jagr had 29 points and Holik had 22. Holik is in the final year of his contract and may be available as a rental player. The only catch is Atlanta, despite being tied for 10th place in the league, is actually in a playoff race in the putrid Southeast division. If the Rangers were able to put together a package for the hard hitting centerman he could be a great match for Jagr again. Jagr's shot may not be what it used to be, but that doesn't mean it is downright terrible. Maybe with another Avery type player on the ice, only with a pair of working wrists, Jagr can get some room to maneuver and score some goals. With Petr Prucha still sitting with a sore shoulder the third-line was made up of Martin Straka, Chris Drury, and Ryan Callahan. That line has some speed and was able to put it together for a goal Saturday afternoon. The lines have been shaken up a lot this season. It seems that everytime it happens the Rangers respond positively and come out with a big game like the game in Buffalo. Don't expect the lines to be dramatically shifted again anytime soon though, Tom Renney has expressed an interest in locking in a set of lines for the playoffs. So hopefully the Rangers don't turn back into pumpkins next week. Henrik Lundqvist played in his first game since signing a rich extension Saturday afternoon. He faced 30 shots and allowed just one goal. Hopefully this is a sign that he has put his struggles behind him. It was Lundqvist's third consecutive victory on the road which is his longest streak since he won five in a row from November 14 to December 1. For news and rumors on the Mets, Yankees, Jets, Giants, Rangers, Devils, Islanders, Knicks, and Nets go to Hot Stove New York.